“Harry Potter” has been heralded as one of the most popular book series of all time and the philosophical nature of Harry, Hermione, and Ron’s quest to rid the world of its ultimate evil is one of the many things that make this series special. 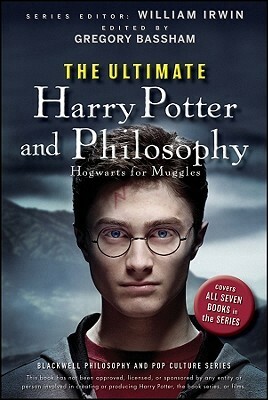 “The Ultimate Harry Potter and Philosophy “covers all seven titles in J.K. Rowling’s groundbreaking” “series and takes fans back to Godric’s Hollow to discuss life after death, to consider what moral reasoning drove Harry to choose death, and to debate whether Sirius Black is a man or a dog. Packed with interesting ideas and insights, “The Ultimate Harry Potter and Philosophy “is an ideal companion for anyone interested in unraveling the subtext and exploring the greater issues at work in the story. I like to think that I have a very analytical mind and that I can’t always accept things at face value. Especially fiction. I guess that’s what lead me to pick this up to explore the Harry Potter universe further and more in-depth (I’ve done the same with Divergent and The Hunger Games series’). This was a fantastic book for people who want to look more into different aspects of the Harry Potter universe (such as death, choices vs. abilities, rebirth, etc.) and it was extremely interesting! I loved how the book went through the entire series and picked up different points that came full circle or were detrimental to examining not only Harry Potter’s character but the wizarding universe as a whole. Classic Fred and George, sneaking their way into everything! Love those boys. I would recommend you pick this up if you’re as infatuated with the series as I am and want to take a closer look into the series! It is extremely analytical so I also recommend reading this in short spurts because you’ll get the most out of it that way.